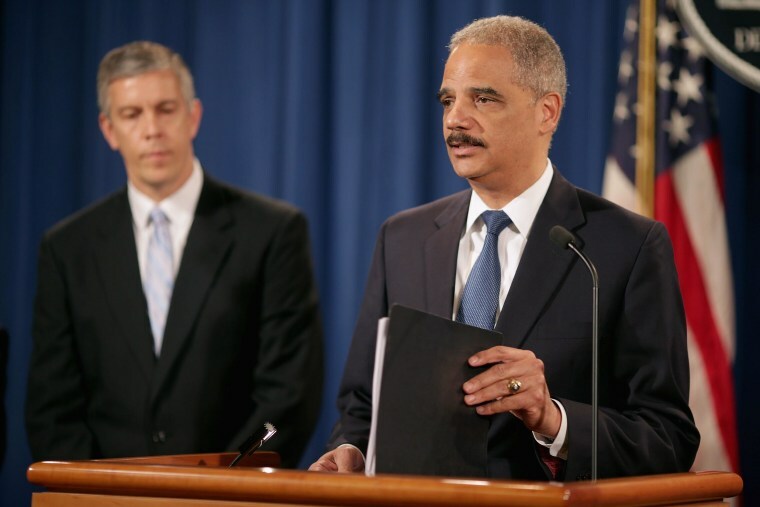 Attorney General Eric Holder and Education Secretary Arne Duncan on Tuesday announced a lawsuit and proposed settlement with Sallie Mae over its practice of charging illegally high interest rates on student loans to military service members. Under the terms of the settlement, Sallie Mae will pay $60 million in restitution to about 60,000 service members. The enforcement action, which the Attorney General said was the first of its kind under the Servicemembers Civil Relief Act, came as Sallie Mae also reached a settlement with the FDIC over its practices with student loans to military service members. Under that agreement, Sallie Mae will pay $36.6 million in penalties and restitution. The settlements come eight years after Congress passed the Military Lending Act, or MLA, which capped interest rates on certain loans, like some payday loans or tax refund anticipation loans, to military service members. Lenders, however, have continued to market loans to service members that are not covered under the MLA, and the Consumer Financial Protection Bureau in late 2013 issued new guidelines to its examiners to help them identify violations of that act. "We are sending a clear message to all lenders and servicers who would deprive our service members of the basic benefits and protections to which they are entitled: this type of conduct is more than just inappropriate; it is inexcusable," Holder said in a prepared statement. In addition to the financial settlement, Sallie Mae is required to ask all three credit bureaus to delete negative credit histories service members had as a result of the unfair lending, and to simplify the process for service members to receive the interest rate reductions they deserve in the future.